Pappone's Pizzeria in Media (1145 W. Baltimore Pike, 484-442-8782) is now serving gluten-free pizza. The crust comes in its own baking tin and the sauce and cheese used for those pies haven't yet been used for wheat pizzas. Kitchen Bar in Abington (1482 Old York Rd., 215-576-9766) can prepare many items gluten free, including all salads and various appetizers and entrees. Joe's Crab Shack has brought its steampots and other gluten-free menu choices to Bala Cynwyd (555 City Ave., 610-949-0391), the seafood chain's third area location. With the presence of Sweet Freedom Bakery, Rex 1516 and Quick Fixx, South Street West is quickly becoming Philadelphia's Gluten-Free Restaurant Row. Now Pure Fare, which serves all of its sandwiches on gluten-free bread at its original spot on 21st Street, is opening a second location at 1609 South. Pure Tacos' Center City location is about two to three weeks away from opening. Vote for them at Mission: Small Business by June 30 to keep them in the running for a $250,000 grant to continue their good work. They need about 70 more votes to make it past the first round. Just search for "Pure Tacos" on the Mission home page after you login with your Facebook ID. It took forever, but Frito-Lay has finally removed the wheat from nacho cheese-flavored Doritos. Old formulations are still on some shelves, so be sure to read the ingredient labels. Crunchmaster has announced its new line of kid-friendly Cheddar Cheezy Crisps and Cinnamon & Sugar Grammy Crisps. Both items are made with 100% whole grains and are certified gluten and peanut free. The snacks have a suggested retail price of $2.48 and will be available for shipment to supermarkets and club stores nationwide starting in August. 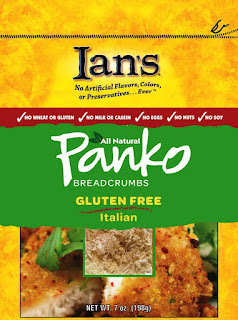 New from Ian's Natural Foods is gluten-free Italian panko breadcrumbs, made with rice flour. You can print a coupon for $2 off a box of Wegmans' new gluten-free mixes good through August 4. Wegmans now stocks Immaculate Baking Co.'s all-natural ready-to-bake gluten-free cookie dough in the refrigerated case. I picked up a package of the chocolate chunk dough (there's also fudge brownie cookie dough) for $2.99, the same price as the glutenous counterparts. Tuesday's post featured Uniquely Greek feta spreads, made locally in Delaware County and sold at area Whole Foods Markets. Whole Foods stores have begun carrying gluten-free baked goods from England's Livwell, including pita bread, English muffins, rolls and pancakes. On Saturday, June 23 at 11 a.m., the new Glen Mills Whole Foods is hosting a gluten-free store tour that includes samples. Sign up at Customer Service or email Meredith Lubking to reserve your spot. Thank you Michael! As usual you always make gluten free life easier! Sorry but the bread crums are not good. My kids will not eat anything with reg bread cums any more this works so well for everything.